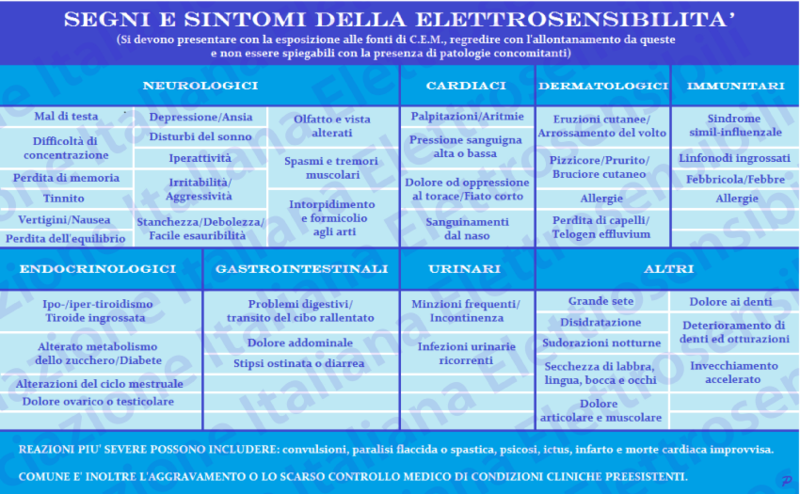 [Lesioni eritematose (rash) per esposizione alle Microonde emesse da un ripetitore di telefonia mobile. Non si tratta di Effetto Nocebo o paranoia, ma di qualcosa di tangibile che, tra l’altro, è noto da decenni e colpisce anche soggetti non dichiaratamente Elettrosensibili (i quali, quindi, non hanno alcun tipo di condizionamento psicologico). Per quanto ancora si continueranno ad ignorare queste evidenze? Nell’articolo che segue, la giornalista ha pensato bene di non includere le foto delle lesioni cutanee oggetto di discussione. A WOMAN believes a severe rash which covered her upper body was caused by radiation from a mobile phone mast. Diana Hilary Boughton has decided to speak out about her concerns over mobile phone masts after David Cameron vowed to relax planning policy to make it easier for operators to put up masts. The Welsh Newton resident said she suffers from electrosensitivity- a condition suffered by people who in varying degrees are made ill by connection to electricity. Some medical professionals believe the condition is psychological. But Ms Broughton said she is used to people being sceptical about her condition, which she said was made worse when she came within close proximity of a mast in Llangrove. She said she has suffered from electrosensitivity for over 15 years, with symptoms such as head pains, tinnitus and pain in her jaw. But when she started a new relationship with a man in Llangrove she noticed her symptoms would get worse when she stayed at his house, even though all electrical devices had been unplugged. Her skin continued to get itchier whenever she stayed at his house, and it then developed into a severe rash with burn-like lesions. Ms Boughton then noticed a mobile phone mast 200 metres away. Her GP prescribed anti-histamines but it became worse and when the lesions spread to the inside of her mouth and throat she attended A&E at Hereford County Hospital and was given an emergency appointment with a dermatologist. Following various examinations and tests, including skin biopsies, the usual causes were ruled out, such as Stevens-Johnson syndrome and Lupus erythematosus. She was told the rash could have been caused by a medication she was taking called Humira. But she said although she believes this weakened her immune system it does not explain why the symptoms were site specific. Please, find below a very important message from Ms Marine Richard in France, the lady who is the first person with the functional impairment electrohypersensitivity to be recognized by a French tribunal and given monetary disability support. Further down you also find my reply to her. As a person with EHS, as an activist and as the first ‘case’ of EHS recognized by a French tribunal as impaired I wish to tell you a word about this important question : what is the best strategy to help people with EHS (and fast !) ? Impairment of disease ? 2/ people with EHS GET sick in a specific environment, different from one person to an other. So it is at the moment impossible to establish a simple ‘systematic cause>systematic consequence’ scheme. We would lose time if we fight on this aspect at the political level as the lobbies use this difference of sensitivity to create a doubt. Time we don’t have as so many people are suffering !!! 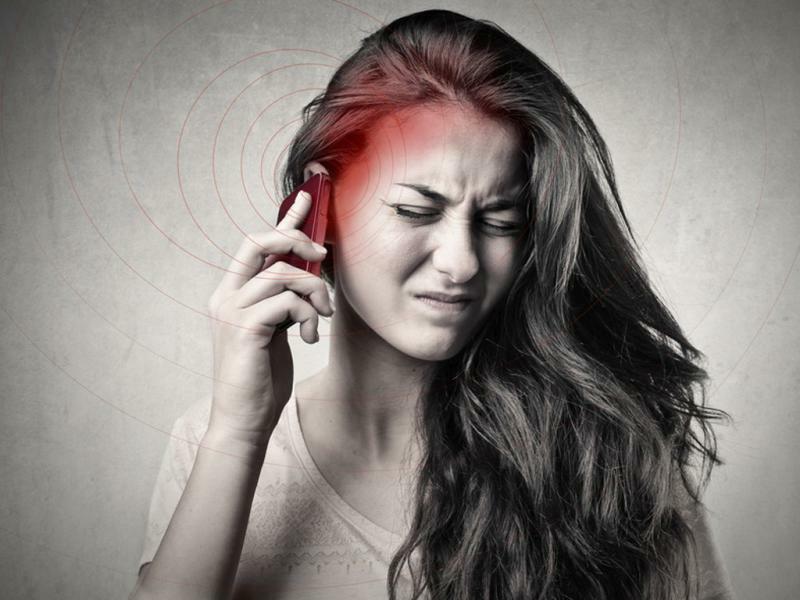 Each person with EMF sensitivities develops a specific nervous response to specific EMFs, at a specific moment probably because of several different factors (nervous over-excitability, high exposure, exposure to chemicals, PTSD, genetic factors – we don’t know the cocktail yet because it has never been studied). Considering that, it is impossible to prove EHS is a disease. 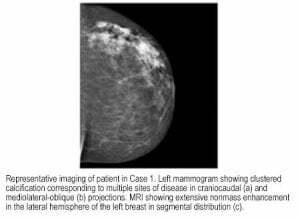 But it is easy to prove that the symptoms appear and disappear depending on the environment. For example, a very easy way to test me (only me as we all are different) : we discovered that if I touch the skin of a person who is using the metallic trackpad of a computer plugged with electric power (and a bad earthing), I can feel a strange sensation in my hand, if you unplug the computer, my strange sensation stops. This test is 100% sure. But only on me ! We tested it several times. People without MY EMF sensitivity can’t feel the difference. So we can say that I have an immediate reaction to EMFs. In the example of the trackpad, it doesn’t cause me a disability. But it simply proves that I do have a reaction to the changes of the environment. 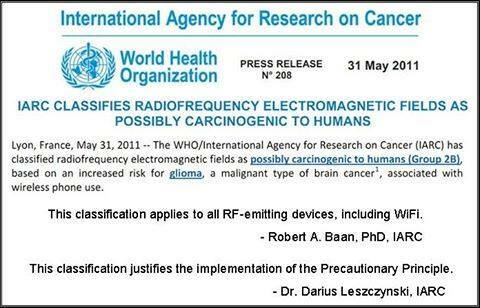 If it is so for me why not for other people with different frequencies and more serious symptoms ? As a consequence, EHS can be an impairment. Nobody can tell us the contrary. 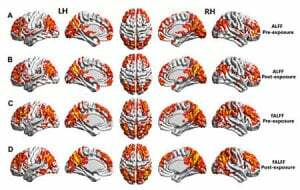 3/ EHS as an intolerance is reversible, there are ways to use neuroplasticity to go back to the sensitivity one had before EHS appeared. There are cases of full recovery or real improvement. But it doesn’t work with everyone, it takes time in a protected zone and it doesn’t change the fact that the environment IS toxic when it is polluted by EMFs. People with EHS and ‘normal’ people with a consciousness should be able to choose the environment they live in. If EHS is recognized as an impairment, the states will have no other choice but to create protected areas where we would be able to live, impaired and not impaired, all together with bees, robins and tomato plants also physically stressed by EMFs (as proved by the research)! I am very, very impressed by your elegant summary, it is so right-to-the-point. If everyone could see what you have learnt – the very hard way – then they would only argue for a functional impairment recognition of electrohypersensitivity, and an immediate clean-up of the environment, as well as an immediate economic reimbursement for all cases of electrohypersensitivity. Accessibility measures are key issues for allowing electrohypersensitive persons, and others with functional impairments, to gain/regain their rightful independence. If such measures are allowed, then full recovery or real improvement will come. As you point out, it doesn’t – however – work for everyone, it takes time in a protected zone, and it doesn’t change the fact that the environment IS toxic when it is polluted by EMFs. Also, always remember that inaccessibility and discrimination are prohibited by law, so society must act. 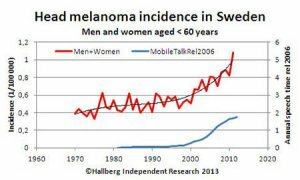 I agree, it is impossible to prove electrohypersensitivity to be a disease … since the sick and ill ‘patient’, with the ‘disease’, is the environment, not the person. [Le fonti di inquinamento elettromagnetico sono sempre più numerose e cresce la preoccupazione a livello internazionale per la salute dei cittadini. Il pericolo è ormai non solo per le strade e nei luoghi pubblici, ma anche dove la sicurezza dovrebbe essere garantita: scuole, ospedali e soprattutto abitazioni. 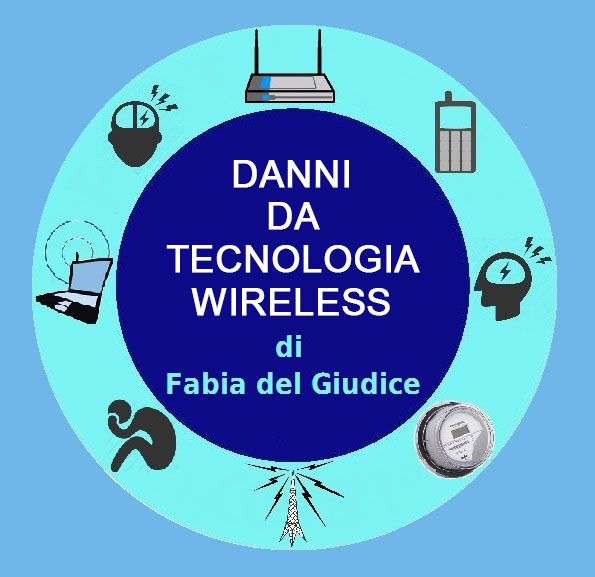 La causa di tutto questo è l’uso inappropriato ed incontrollato delle tecnologie Wireless: apparati Wi-Fi, telefoni DECT, ripetitori di telefonia mobile e di segnali radio-televisivi digitali posizionati in prossimità delle abitazioni, allarmi satellitari ed apparati di videosorveglianza Wireless, ecc. Le persone sono sempre più stanche e si ammalano con maggiore facilità, invecchiano anzi tempo e manifestano sempre più precocemente le malattie un tempo tipiche dell’età avanzata. Students, among the biggest victims of excess Wi-Fi radiation, are starting to speak up. 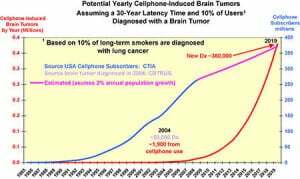 Kill Zone USA notes there are now 594,309 cell towers emitting pulsed radiation. Wireless burglar alarms are a no-no. “I feel extremely uncomfortable going to school every day, supposedly a safe haven, and seeing my friends sitting directly under the transmitters,” she said. 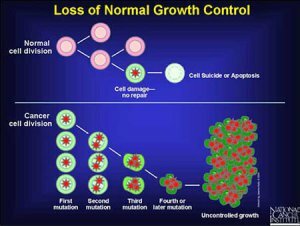 “Renowned scientists all over the world have shown the possible side effects of radiation including brain cancer, tumors, blood/brain barrier deterioration and other effects,” she added. “It is a violation of the rights of students and teachers,” she said. Also on the same posting of Safe Tech for Schools Maryland are videos of mothers and fathers asking for the schools to switch to wired equipment. Students at a high school in Ottawa have petitioned the government to remove Wi-Fi from schools. They have the support of Frank Clegg, president of Microsoft Canada for 14 years who is now CEO of Canadians for Safe Technology. “The Parliamentary Health Committee has already heard evidence and unanimously agreed that more caution is required particularly in schools, so I agree with the students it’s time the Prime Minister makes the health of every student in Canada a higher priority,” he said. 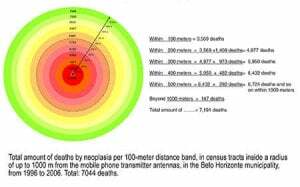 Kill Zone USA, using stats of antennasearch.com, says there are 594,309 cellphone towers equipped with 1,805,623 antennas “delivering relentless wave carcinogens to 321 million Americans. Wi-Fi signals bombarding this reporter’s NYC apartment. New York City is one of the most heavily radiated cities, says Kill Zone. Within one square mile of City Hall in New York, there are 1,248 wireless antennas. Times Square has 178 cell towers and 2,510 antennas. Kill Zone quotes New Networks Institute as saying, “This is only a fraction of the antennas and cell sites in Time Square since neither Verizon or the Federal Communications Commission has any complete data or documentation about the number of lines or even wireless cell sites. ABC-TV’s science program Catalyst presented a half-hour special Sept. 16 hosted by Maryanne Demasi, Ph.D., Australian science reporter, raising the question of whether wireless devices are harmful to health. “Australia’s safety agency says there’s no evidence of harm, but that’s not the same as saying it’s safe,” says ABC-TV description of the program’s position. Among those quoted is Devra Davis, Ph.D., an epidemiologist who has called on schools to switch from wireless to wired web access. “In terms of the way the story was reported, there was very selective reporting of existing data, sensationalist headlines, and experts with potential conflicts of interest,” he said. Electricsense.com says that wireless burglar alarms are dangerous because they use the same type of radiation emitted by cordless telephones. Such devices give out electromagnetic radiation 24/7, says Lloyd Burrell, who operates the site. Bellringer, alarm systems, Long Island, said about 65% of its 9,000 customers use wireless. Some use both wired and wireless, it said. IL COMITATO NON SI ACCONTENTA DELLE ASSICURAZIONI DELL’ARPA. DOPO I CONTROLLI DELL’ARPA: Fabia Del Giudice, di “Lecce via cavo”, si appella al rispetto del Principio di Precauzione invocato dall’Unione europea. “In mancanza di certezze sui danni indotti dall’elettrosmog si deve applicare intensamente quel principio di precauzione fortemente invocato dall’Unione europea”. Fabia Del Giudice, del Comitato “Lecce via cavo”, interviene dopo le rassicurazioni di Arpa Puglia, in seguito ai monitoraggi effettuati in città. Nessuno sforamento dei limiti di legge, ha fatto sapere Arpa. “Anche se – commenta ora Del Giudice – quei limiti non tutelano la salute dei cittadini”. E chiarisce perché. “L’esposizione alle radiofrequenze cui siamo quotidianamente esposti – spiega – può causare danni al Dna e indurre l’insorgenza di tumori. Un nuovo fattore di rischio anche per altre patologie, perché interferiscono con il corretto funzionamento del sistema immunitario, endocrino, cardiocircolatorio e nervoso”. 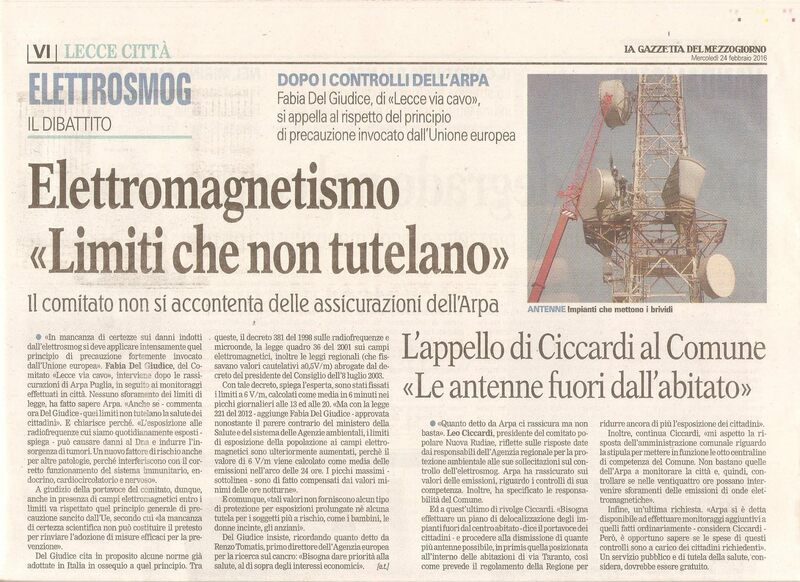 A giudizio della portavoce del comitato, dunque, anche in presenza di campi elettromagnetici entro i limiti va rispettato quel principio generale di precauzione sancito dall’Ue, secondo cui “la mancanza di certezza scientifica non può costituire il pretesto per rinviare l’adozione di misure efficaci per la prevenzione”. 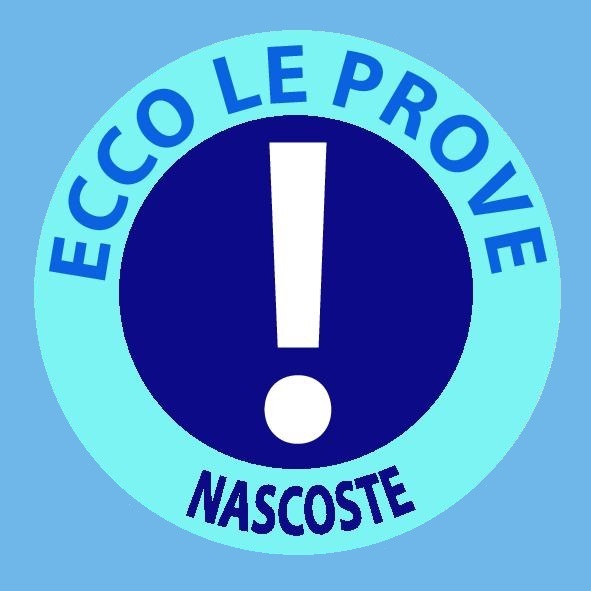 Del Giudice cita in proposito alcune norme già adottate in Italia in ossequio a quel principio. Tra queste, il decreto 381 del 1998 sulle radiofrequenze e microonde, la legge quadro 36 del 2001 sui campi elettromagnetici, inoltre le leggi regionali (che fissavano valori cautelativi a 0,5 V/m) abrogate dal decreto del presidente del Consiglio dell’8 luglio 2003. Con tale decreto, spiega l’esperta, sono stati fissati i limiti a 6 V/m, calcolati come media in 6 minuti nei picchi giornalieri alle 13 ed alle 20. “Ma con la legge 221 del 2012 – aggiunge Fabia Del Giudice – approvata nonostante il parere contrario del Ministero della Salute e del sistema delle Agenzie ambientali, i limiti di esposizione della popolazione ai campi elettromagnetici sono ulteriormente aumentati, perché il valore di 6 V/m viene calcolato come media delle emissioni nell’arco delle 24 ore. I picchi massimi – sottolinea – sono di fatto compensati dai valori minimi delle ore notturne”. E comunque, “tali valori non forniscono alcun tipo di protezione per esposizioni prolungate né alcuna tutela per i soggetti più a rischio, come i bambini, le donne incinte, gli anziani”. Del Giudice insiste, ricordando quanto detto da Renzo Tomatis, primo direttore dell’Agenzia europea per la ricerca sul cancro: “Bisogna dare priorità alla salute, al di sopra degli interessi economici”. Elettrosmog: i cellulari possono danneggiare la salute. Perché non dirlo? Insieme a Internet, ha rivoluzionato le nostre vite. Parlo del telefono cellulare. Avevo appena compiuto vent’anni, quando nel 1973 Martin Cooper fece la prima telefonata con un cellulare che pesava 1,5 chilogrammi. Da allora, appunto, le nostre vite sono cambiate. E oggi cellulare e internet si fondono addirittura in un unico strumento, senza il quale ci sentiamo “nudi”. Peccato però che non si dica che l’utilizzo del cellulare possa anche avere effetti negativi. Non parlo qui dei ragazzini che socializzano (si fa per dire) tutto il giorno solo tramite whatsapp, che non è il mio campo, bensì degli effetti sulla salute. Già, perché non tutti sanno che la Corte di Cassazione – sezione Lavoro – con sentenza 17438 del 2012 abbia respinto il ricorso con il quale l’Inail contestava il diritto alla rendita per malattia professionale, con invalidità dell’80%, riconosciuto dalla Corte di appello di Brescia a favore di un manager che per dodici anni, per cinque-sei ore al giorno, aveva usato – per motivi di lavoro – il telefonino sviluppando una grave patologia tumorale all’orecchio sinistro, dove appoggiava il cellulare. Ma la sentenza della Corte non è che la conferma nel campo del diritto di ciò che seri studi epidemiologici vanno dicendo da tempo. In un’intervista del 2013 proprio su ilfattoquotidiano.it, il ricercatore del Cnr Fiorenzo Marinelli aveva modo di affermare: “Non ci sono dubbi del profondo impatto biologico delle radiazioni di radiofrequenza. Il telefonino è uno strumento molto inquinante e dannoso per la salute. La I.A.R.C. 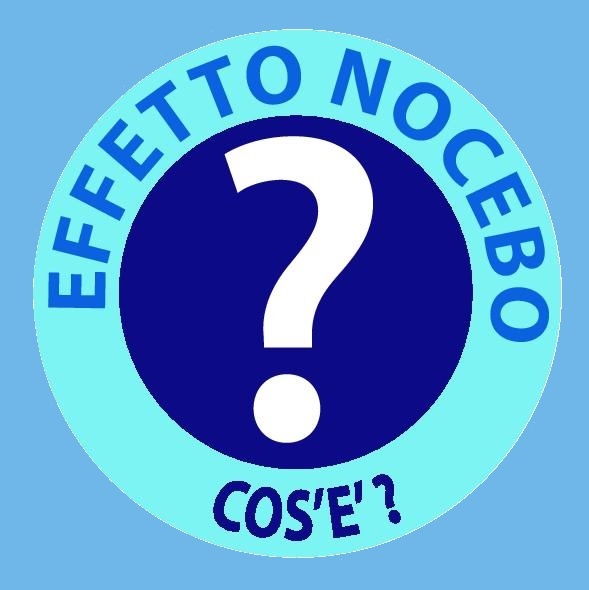 (Agenzia Internazionale per la ricerca sul cancro) nel maggio 2011 ha classificato le radiofrequenze nella classe 2B cioè ‘possibili cancerogeni per l’uomo’ sulla base degli studi epidemiologici fatti dal prof. Lennart Hardell che ha riscontrato un maggior rischio di tumori cerebrali negli utilizzatori di telefono cellulare. Rischio che arriva a quattro volte se si tiene conto della lateralità dell’uso”. Insomma, la ricerca è al corrente del possibile collegamento tra patologie gravi ed errato uso prolungato del cellulare, ma l’opinione pubblica non ne è al corrente. Costerebbe molto colmare la lacuna?Francia, Belgio ed Irlanda informano gli acquirenti dei cellulari di tale possibilità. L’Italia no. Nasce da questa considerazione la recente interpellanza presentata in Senato dal M5S in cui si chiede che il governo riferisca in merito a tale latitanza. Nel contempo, lo stesso Movimento sta lavorando con l’avvocato Stefano Bertone di Torino – che da tempo segue la problematica – a un disegno di Legge in materia. Tra l’altro, in merito alla latitanza del governo, pende un ricorso al TAR Lazio presentato dalla A.P.P.L.E. (Associazione per la Prevenzione e Lotta all’Elettrosmog) affinché l’esecutivo effettui una immediata campagna di informazione pubblica circa i rischi di insorgenza di tumori in merito all’errato utilizzo dei cellulari. In conclusione, la strada già seguita per il tabacco (“nuoce gravemente alla salute”) è aperta. If you’ve ever wondered if the thousands of cell phone towers and electromagnetic signals permeating society nowadays could be potentially harmful to your body, mind and to the natural environment, you’re not alone. A small minority of people are so sensitive to electromagnetic radiation they’ve even been forced to move into cave-like domiciles designed to insulate them from such signals. We are, after all, energetic beings, as are all lifeforms, and although something may lie outside of our ordinary perception does not imply that it is harmless. 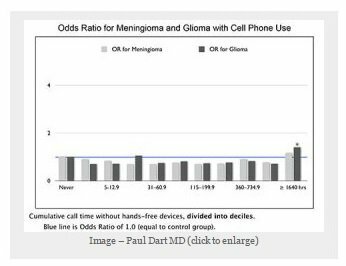 It turns out that electromagnetic signals from cell phone towers do in fact directly affect the human body in physical ways, and surprisingly, for amputees, common cellular signals can amplify sensations of pain in the body, when in the presence of such emissions. A recently completed study led by members The University of Texas at Dallas gives concrete evidence that these types of now ubiquitous signals can actually amplify pain in some amputees by immediately stimulating nerve tissue that had suffered traumatic damage. 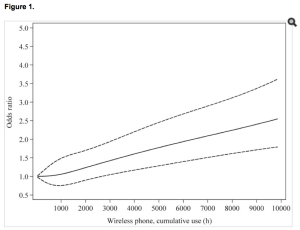 Prior to this study, the bulk of research into cell tower radiation focused on people without any pre-existing conditions or serious health issues, however, when a disabled veteran who lost limbs in the Iraq war alerted his physicians to the fact that his sense of pain seemed to increase dramatically whenever his cell phone went into roaming mode, a study was launched to test this hypothesis on lab rats. 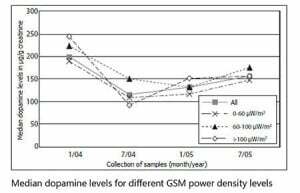 This is the first study of its kind that has found a direct link to immediate physical changes in the human body when absorbing cell tower radiation. To validate the wounded soldier’s claim that pain was amplified by cell tower signals researchers crafted a simulation using lab rats who were subjected to the types and levels of electromagnetic radiation that many of us are exposed to every day. To test this, the team randomly assigned 20 rats into two groups — one receiving a nerve injury that simulated amputation, and the other group receiving a sham treatment. 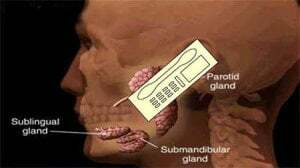 Researchers then exposed the subjects to a radiofrequency electromagnetic antenna for 10 minutes, once per week for eight weeks. The antenna delivered a power density equal to that measured at 39 meters from a local cellphone tower — a power density that a person might encounter outside of occupational settings. These towers are being installed across the world right now, right amongst densely populated areas and even on public school grounds. 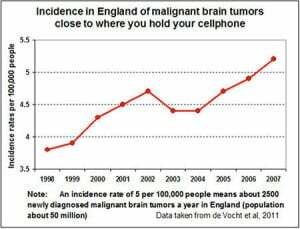 Cell phones have already been proven to cause brain cancer, yet the both the cell industry and the general public refuse to consider this sufficient reason to re-think the use and widespread proliferation of this technology. Now that we have evidence that cell tower signals can amplify pain, is it that unreasonable to consider that cell tower radiation may be causing other health problems that we simply have yet to identify? Alex Pietrowski is an artist and writer concerned with preserving good health and the basic freedom to enjoy a healthy lifestyle. He is a staff writer for WakingTimes.com and Offgrid Outpost, a provider of storable foodand emergency kits. Alex is an avid student of Yoga and life. 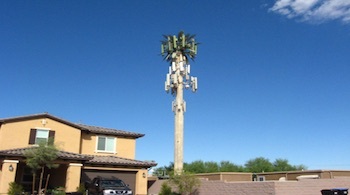 This article (Study Proves Electromagnetic Fields from Cell Towers Can Amplify Pain) was originally created and published by Waking Times and is published here under a Creative Commons license with attribution to Alex Pietrowski and WakingTimes.com. It may be re-posted freely with proper attribution, author bio, and this copyright statement.